The Ocean conference, which was held between June 5-9, 2017 was held to support the implementation of Sustainable Development Goals (SDG) 14 – Conserve and sustainably use the Oceans, Seas and Marine Resources for Sustainable Development, according to a BVI London Office Press Release. In addition, according to the press release, Dr Pickering welcomed the commitment by the Economic Commission for Latin America and the Caribbean to provide the VI with technical assistance for the implementation of the Sustainable Development Goals. 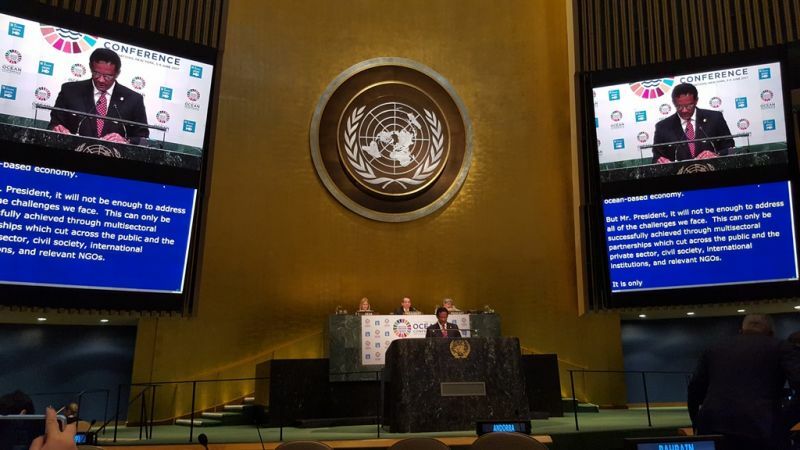 In the Deputy Premier’s presentation, he said “I am pleased to report that the United Nations at the regional level has been responsive to the needs of microstates such as the Virgin Islands. The Economic Commission for Latin America and the Caribbean has selected us as one of the first round of countries in the region to receive technical assistance for the implementation of the Sustainable Development Goals,” the Minister for Natural Resources said. However, he further called on the United Nations to provide greater support from across its various agencies to Overseas Countries and Territories (OCTs) that are Associate Members of the regional commissions. Dr Pickering has since returned to the VI where he will be peppered with questions at the June 13, 2017 Sitting of the House of Assembly by Third District Representative and former Opposition Leader Hon Julian Fraser RA. coral reefs. But no--- we allow private businesses to pump up coast line for personal gain-- many without permits or surveys. These are the regulations that should be implemented if the minister wants to put his money where his mouth is. Then again, maybe he is MAKING money by not challenging environmental violations. He can't talk out of both sides of his mouth. Unfortunately, I do not find him that committed by example. Matter of fact, I don't find anyone in this government other than the stressed out CFD trying to oversee development that might harm our oceans with its erosion. That's the best of he. What is his track record as a Minister for the past 6 years? He is Dancia 2.0. This guy been eating off the hog so long, he now lives in a world unbeknown to us. We locals are so small mined and so ignorant it's really sad. We have no vision and zero care of interest for the Virgin Islands sad very sad we don't see the bigger picture.